Recommended for separations in organic or mixed organic/aqueous mobile phases. SepaxGP-C18 uses full coverage bonded silica packing, which provides exceptionally high stability. Figure below shows the highly reproducible retention time for three standard compounds: aniline, anisole and toluene after 13,000 column volume runs in a mobile phase of 85% methanol and 15% water. 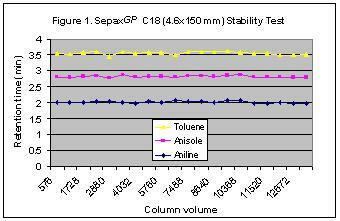 Such high stability allows SepaxGP-C18 extremely suitable for validation of various analytes. Selectivity is very important for detection of the components of low abundance and impurities from the analysis of pharmaceuticals in the real applications. 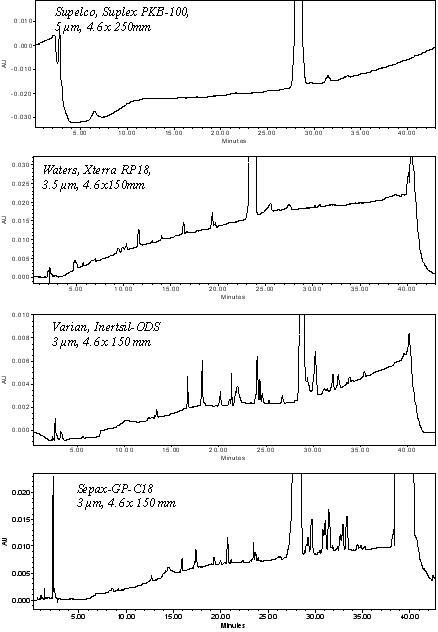 The comparative tests shown below from the method development of a drug molecule clearly demonstrated that GP-C18 is among the best products for high selectivity and sensitivity in detecting low abundant components and the impurities.